Hey friends!! 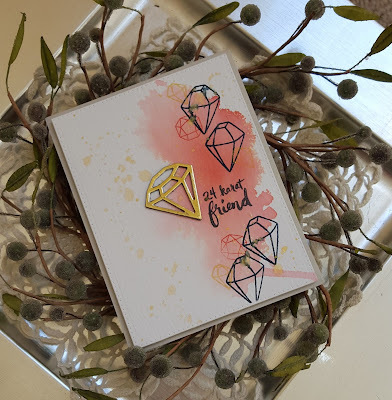 Popping in with a card I made for a few challenges: Essentials by Ellen September Pinsights, Simon Says Stamp Monday challenge - ombre and Less is More - Shiny (I do hope this passes muster with the LIM team!). I did some watercoloring, again. After watercoloring my paper and letting it dry I added the little gems using dark blue ink, coral ink (the same ink color used for the watercoloring) and Delicata Golden Glitz. I added some splatters of gold using Golden Glitz mixed with water. 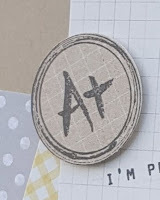 After everything was dry I die cut the watercolor paper using the largest die in the A Jillian Vance Design Polka Dot Rectangle Backdrop die. The gem was die cut from dark blue cardstock and gold mirror cardstock and then adhered together. I added the sentiment and then adhered the gold gem. I learned a valuable lesson while I was making this card and that is this: all washi tape is not created equal. Some washi tape is really good for taping down your watercolor paper to prevent warping of the paper and some washi tape is not so good. Unfortunately I used some not so good washi tape this time around and ended up with more warping than I was expecting. Live and learn... 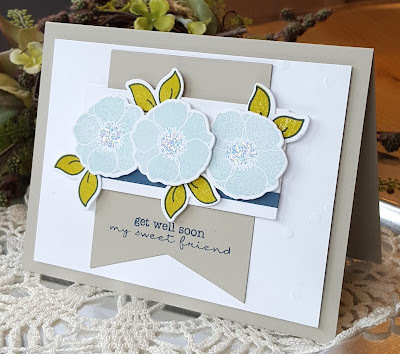 I like how the watercolored background turned out, but the stamping not so much... but that is papercrafting and life... a learning process! Hey friends!! 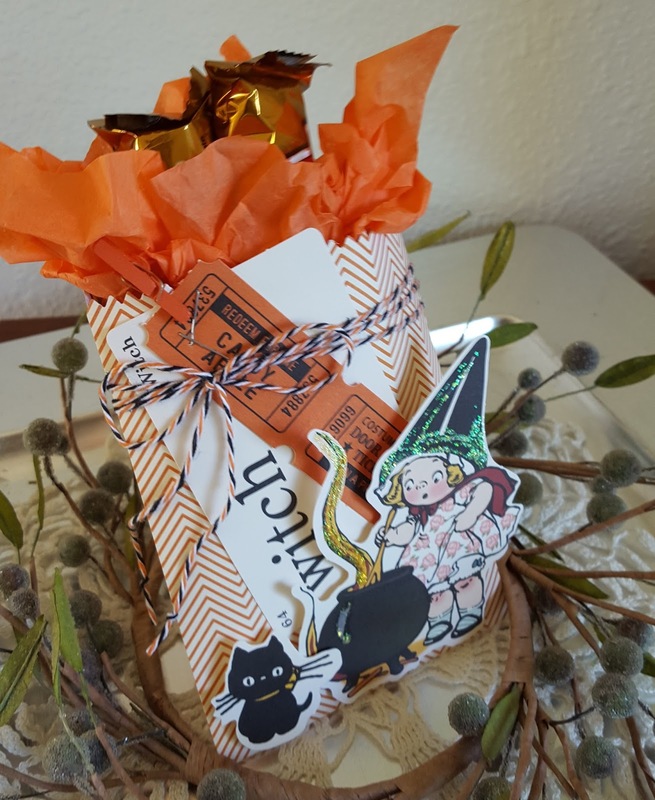 Popping in with a card that I made for a few challenges as well as a little treat bag that I made for the very first ChouxChoux challenge: fall or Halloween theme. 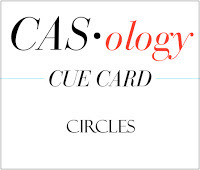 First up is the card. 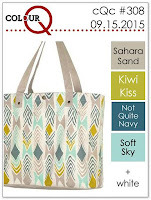 I used the colors from this week's ColourQ challenge and the Essentials by Ellen Bokeh Dots stamp set. Pretty self-explanatory card. 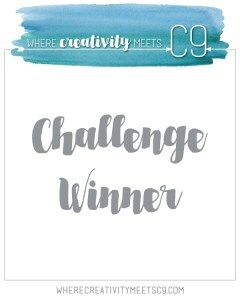 I will be entering it into the current CASology challenge: circles, as well as Simon Says Stamp Monday challenge to use a stamp and the Simon Says Stamp Wednesday challenge: no designer paper. 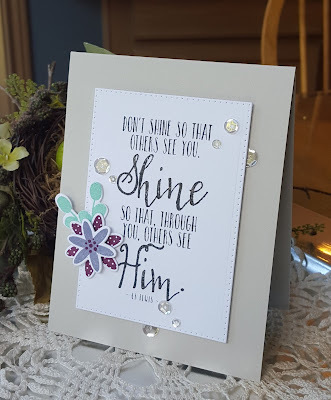 The main panel was die cut using the AJVD Polka Dot Rectangle Backdrop dies and I used my brand-spankin' new Big Shot Plus to do the die cutting... YAY!! So happy to be able to die cut stuff, again!! After stamping all the circles and dots I added some My Mind's Eye wooden dots to bring in the darkest of the two greys and then mounted the panel on some dark grey cardstock. 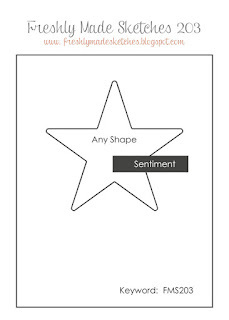 The sentiment is from the Essentials by Ellen Fancy Thanks. Very clean and very simple! I think it would be a great card for a guy. Next up is the little treat bag. 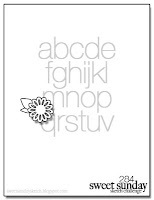 Several months ago I purchased a treat bag die set from Stampin Up! and finally pulled it out to create a couple of little treat bags. I made one that I will be sharing at a later date and when I saw the ChouxChoux challenge I decided to finish the second bag I made and post it to that challenge. The bag was made using paper from the October Afternoon Witch Hazel 8x8 pad. I also had a package of Witch Hazel ephemera and so I pulled out some pieces to decorate the bag. I stapled the tickets to the little card an then adhered that to the bag. Some black, white and orange baker's twine was tied around the bag and then I added the little witch and the black cat. I added some stickles to the witch's hat, the steam rising from the pot and a little orange clothes pin. Some orange tissue and a couple of treats were tucked inside. When I die cut the treat bags with my Big Shot it was a little tricky, but now that I have the Plus I have lots of extra cutting space making it so much easier to cut the bags... yay!! I will definitely be making more of these little treat bags!! 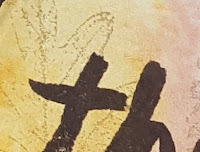 Thanks for stopping by and sticking with this rather long post! Hey friends!!! 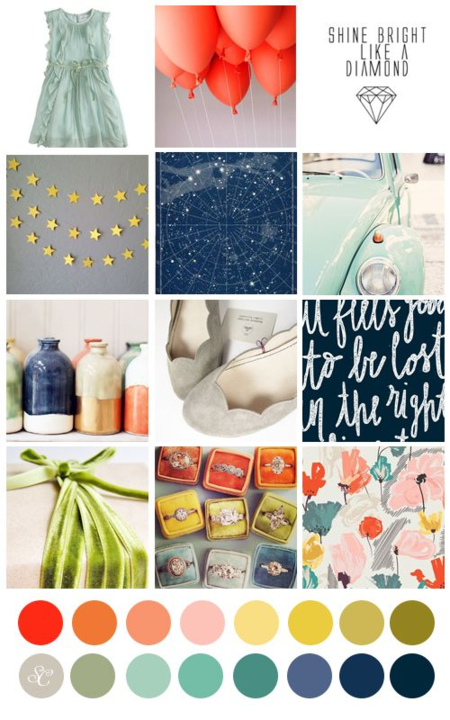 Popping in with my project for this month's PTI blog hop. Nichole gave us a lovely inspiration photo of a door decorated for fall. I had recently purchased the PTI Twig Wreath stamp set and matching dies so it was a no brainer that I would use those for my project. 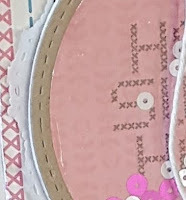 I had planned on creating a set of tags using the black tags that came in the Make It Market Mini Kit Still Life Summer, but when my Big Shot broke in the middle of die cutting all the little pieces for the wreath I had to change my plans. 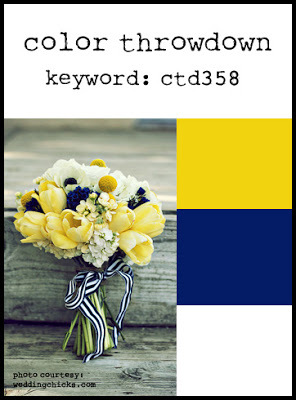 I ended up making a "tag-card". I inked up the edges of the tag with white ink and then smeared it with my finger. 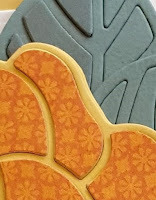 I added some partial embossing using a woodgrain embossing folder and then added a bit more white ink. The wreath was adhered along with all the little bits as you see. 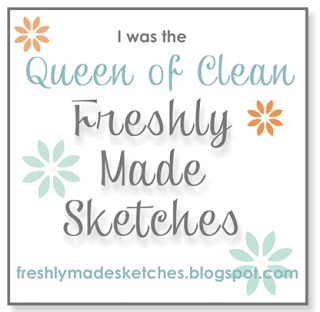 I created a little sentiment banner and adhered it. A second tag was scored along the top and adhered to the front tag to create my "tag-card". Finished things off with some rustic twine tied in a bow. 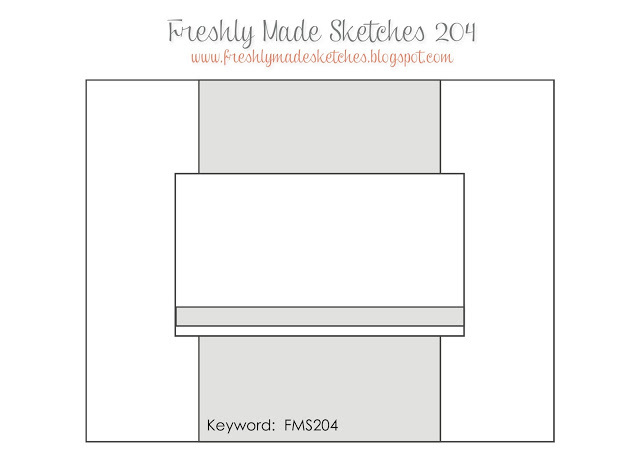 Despite my original plans being derailed I'm pretty pleased with how my little tag-card turned out! 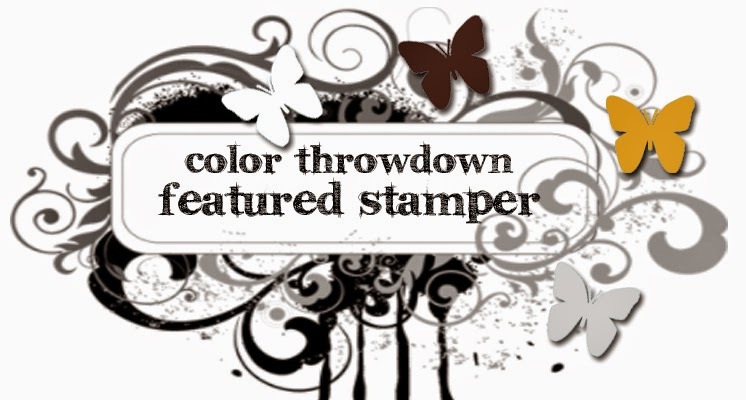 Posting this to the current Simon Says Stamp Monday challenge to use a stamp and the current AAA Cards challenge: fall colors. Thanks for stopping by today... and happy hopping!! Hey friends!! Fall is officially here and that means time for the fall Coffee Lovers Blog Hop. Precious Remembrance Shop is a super sponsor for the hop and that means everyone who participates has a chance to win the super fun PRS set Fall Colors. 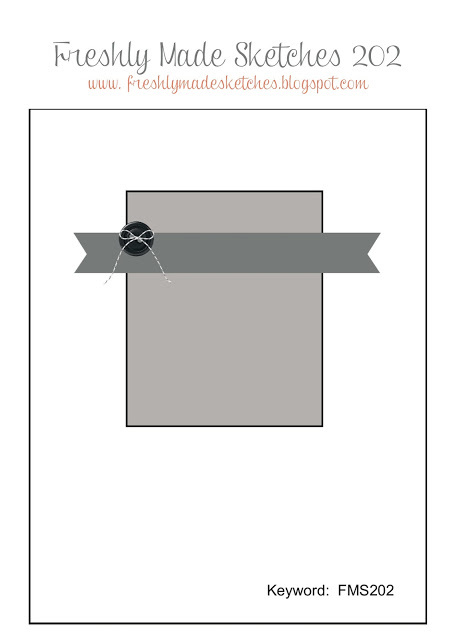 Everyone on the PRS design team has a card that we created for the hop using Precious Remembrance Shop stamps. I used the coffee related set Coffee Love. I'm not a coffee drinker, but I will have the occasional mocha or peppermint mocha. My drink of choice is a Chai Latte (all soy no water). 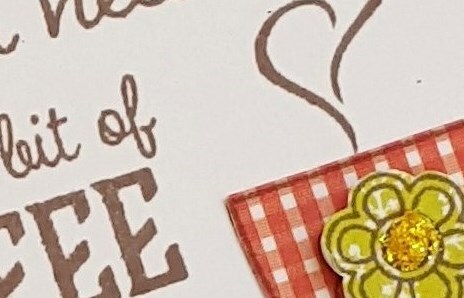 But that is a great thing about the Coffee Lovers blog hop...you can make a card using tea or hot cocoa images, as well!! So... the "to go" cup on my card has a yummy hot and steaming Chai Latte in it!! 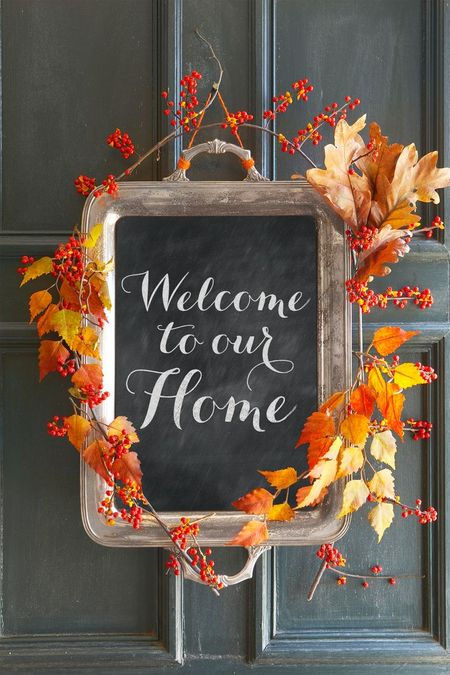 In keeping with the theme of fall I used a warm color palette of orange, golden yellow, brown and red with a bit of dark brown and kraft thrown in. I stamped the to go cup on some cream paper and trimmed out the coffee cup lid and the center band. The cup was stamped again on plaid paper and the entire thing trimmed out. I added the lid and center band to the plaid cup. 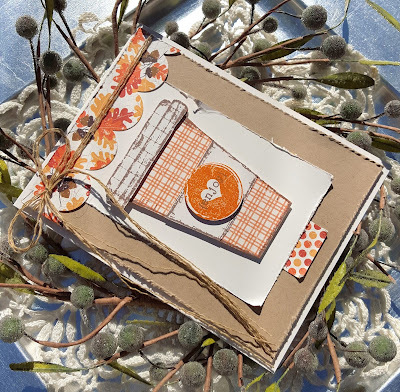 The little circle heart image was stamped in orange ink and the sentiment "enjoy" was stamped in brown. I punched it out with a circle punch and added it to the center band. The layout for my card is based on the current Freshly Made Sketch so I will be adding my card to that line up, as well. Posting this to the current Really Reasonable Ribbon challenge to use orange. Thanks for stopping by today... enjoy your coffee and the hop!! Hey friends!! Popping in with a quick post of a card I made using the Viva La Verve week 3 sketch. 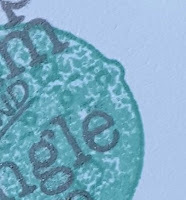 I'm also posting this to the current Simon Says Stamp Monday challenge to use your favorite technique. On Friday my Big Shot broke (boo hoo!) and so I'm now waiting for my new one to arrive. That means I have to do things kinda "old school" and one of my favorite "old school"/techniquey things to do is paper piece. I also used another favorite technique on this card of paper distressing. 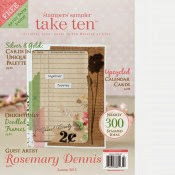 The patterned paper is from the older My Mind's Eye Indie Chic 6x6 pad. The stamps are from Verve: Proverbs 16:24 Plain Jane and The Buzz stamp set. I cut all the papers and the burlap piece and distressed all the edges. 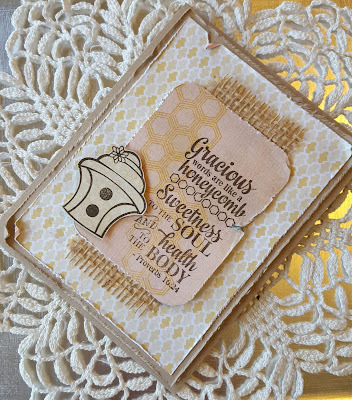 The sentiment panel was stamped with the honeycomb image from The Buzz in yellow ink and then with the sentiment in dark brown. I stamped the little bee hive from the set on some additional patterned paper, trimmed it out (I have the matching die, but no Big Shot equals no die cutting, lol!) and then popped it up with foam dimensionals. Hey friends!! 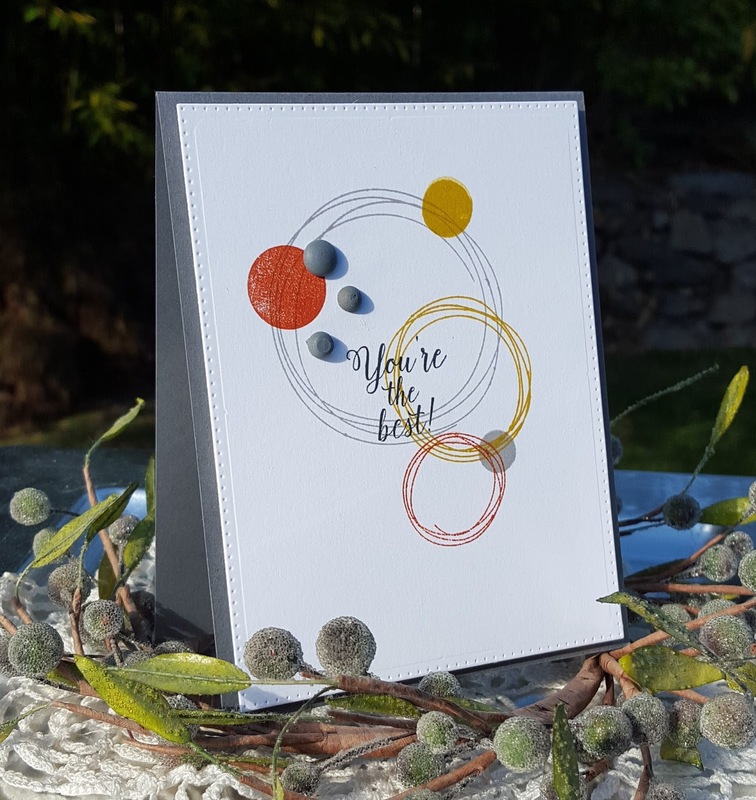 Popping in with a card I made for a couple of challenges, ColourQ and Freshly Made Sketches. I used a couple of older My Favorite Things stamp sets, along with a new one and dies that match the new set and two of the old sets. The old sets I used are Sweet Roses and Pretty Poppies. The new set is Delicate Pretty Poppies. I have MFT poppy dies that match Pretty Poppies and Delicate Pretty Poppies and the dies that match Sweet Roses. I also used the Jumbo Fishtail Flag Stax dies. I kept the navy color in the background by using it in small qualities and focusing more on the light blue, bright green and the sand color. I fiddled around with some of the flowers in the Pretty Poppies set before deciding to use to one flower three times. I didn't like the way the leaves that are in the Pretty Poppies set looked with the flowers so I grabbed my Sweet Roses set and used the smaller leaf cluster from that set. 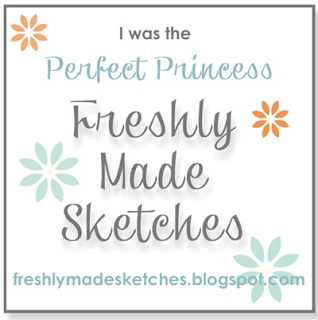 The sentiment is from the new Delicate Pretty Poppies. I added some partial embossing using my favorite embossing folder (SU! 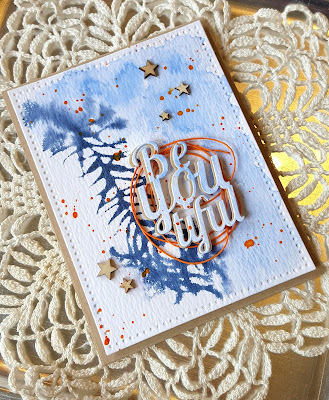 's Decorative Dots), die cut the jumbo banner and then layered everything up on the card base. Finished things off by adding Crystal Stickles to the center of each of the flowers. 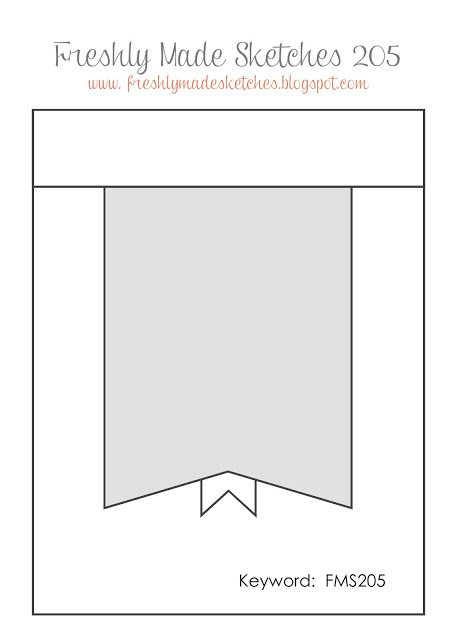 Also adding this to the current Simon Says Stamp Wednesday challenge: die cuts. Hey friends!! The weekend is over and my boys will have their first full week of school... I'm sure they are really looking forward to that, lol!! 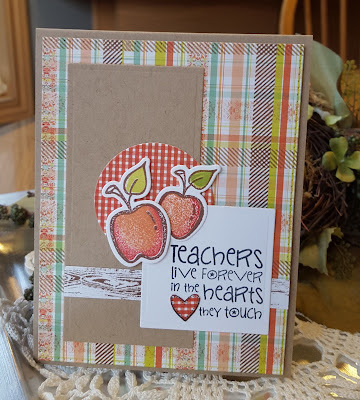 Have a card to share that I made today using one of my favorite Verve sets, Teachers Count and the matching Apples dies. 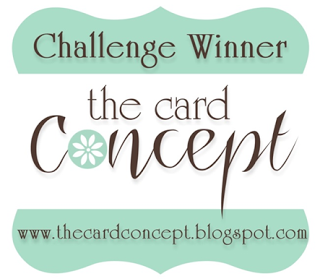 The card layout is based on the Viva La Verve week 2 sketch. I used some lovely papers from the Webster's Pages Family Traditions line. 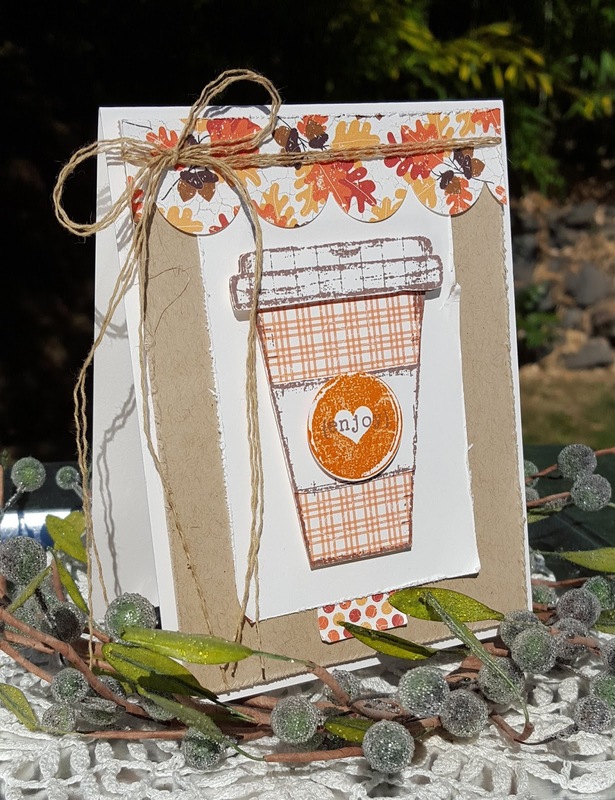 I will also be posting this to the current Word Art Wednesday challenge celebrating their 200th challenge, to the current Simon Says Stamp challenge: use a stamp and to the Verve Diva Inspiration challenge: Autumn Lovelies . I die cut the main panel using my AJVD Polka Dot Backdrop die set... absolutely love that set of dies!! Spellbinders dies were used to cut the circle, square and long rectangle. The apples were die cut and stamped with the outline using medium brown ink. 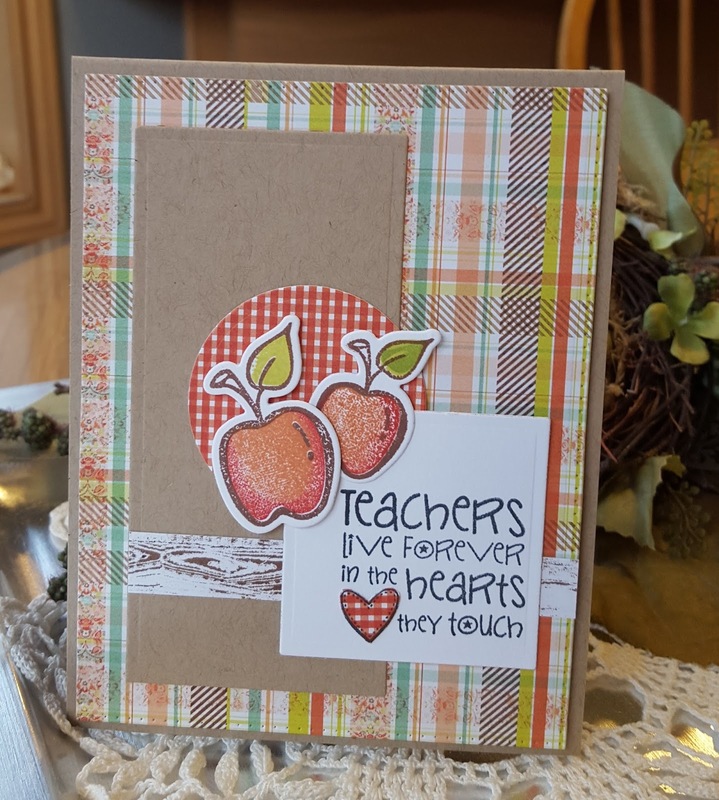 The solid apples were inked up with Stampin Up! Groovy Guava and then rolled in Ruby Red ink to get the color I wanted... really like how they turned out! 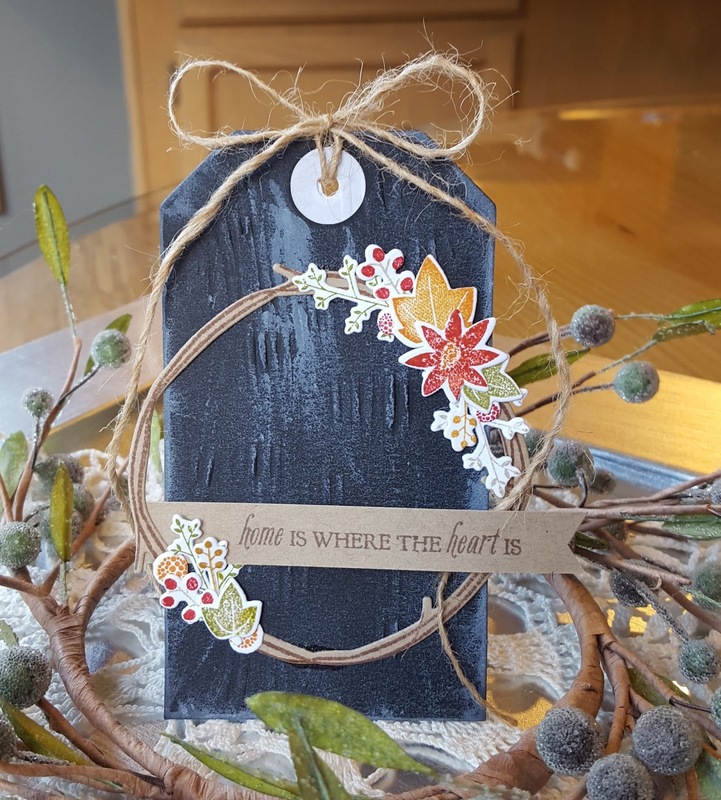 Stamped the sentiment on the square and then layered everything up. Finished things off by adding a little gingham heart to the sentiment. Hey friends!! Well the boys made it through the first few days of school. It was a bit of a rocky start for my 11th grader. His classes kept getting changed and he was pulled out of a class that he really wanted to be in, but thankfully they were able to re-arrange his schedule and he is back in the class he had been pulled out of... all's well that ends well! Things went better for my 3rd grader (yes... I have one in high school and one is elementary school!) even though he doesn't have any of his friends in his class. Anywhoo... 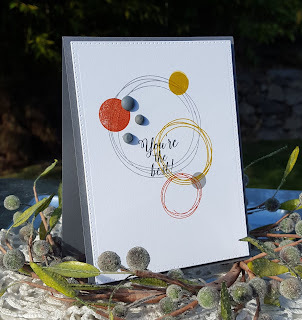 I had some time this afternoon and made a card for a few challenges: ColourQ, Freshly Made Sketches, Simon Says Stamp Monday challenge (stamp and die/punch) and Simon Says Stamp Wednesday challenge (use a stamp). 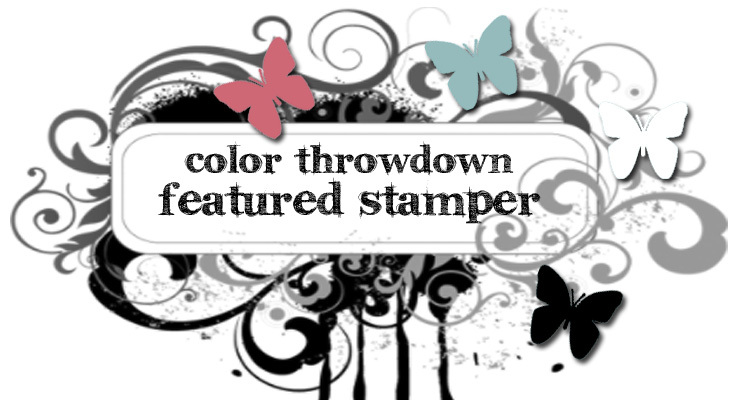 Pulled out a couple of favorite Stampin Up! 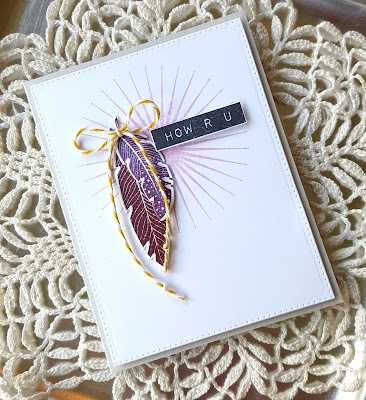 set (Kinda Eclectic and Four Feathers) to create my card. I stamped the sun image from Kinda Eclectic in PTI's Lavender Moon on a piece of white cardstock that I die cut with the largest die in the AJVD Polka Dot Backdrop die set. The feathers were stamped in Bravo Burgundy (SU!) 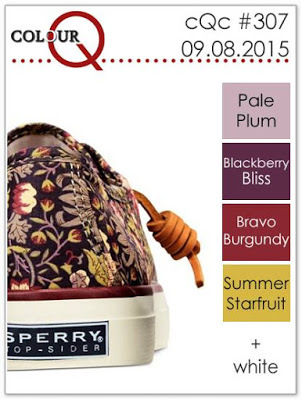 and Pansy Purple (Close to My Heart) and die cut with the matching SU! Feathers Framelits dies. After adhering the feather together and attaching them to the main panel. I brought in the yellow color with some baker's twine tied in a bow and attached to the feathers. The sentiment from Altenew Label Love was stamped in black, trimmed out and popped up on the panel. Easy peasy... lemon squeasy! 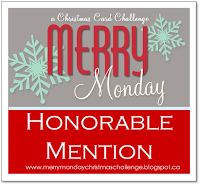 Realized that this will also work for the current Word Art Wednesday challenge... they are celebrating their 200th challenge with lots of prizes. Make sure you check it out! 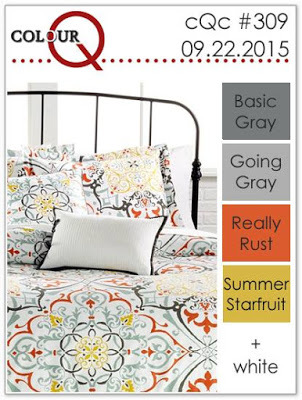 Guesting for Color Throwdown #359!! Hey friends!! 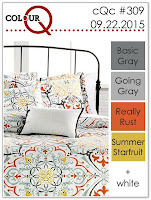 Today I'm guesting over on the Color Throwdown challenge blog... YAY!! 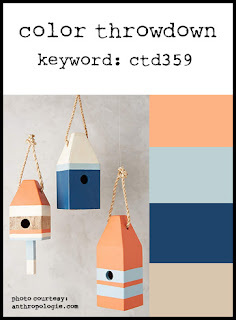 The color combo is a fun one of light, dark blue, orange and kraft. I decided to go outside my box and do some water coloring. I'm not kidding when I tell you that this card took me two days to make... two days, lol!! That was because I wanted to make sure my water colored piece was completely dry before I completed it. I also spent a good deal of time making sure I created a piece that I was happy with. I started by spritzing my water color paper (Ranger/Tim Holtz distress water color paper) in one corner and then adding the light blue color using my Kuretake Gansai Tambi water color paints. I let that dry a bit and then moved onto the stamping portion. The current Essentials by Ellen challenge is the "Mix it Up" challenge. That means you need to mix your Essentials by Ellen products with those from another company. This month it is Impression Obsession. I own exactly one IO product... the large feather die. Initially I wanted to use it as a stencil but after trying it I decided I really didn't like the look. 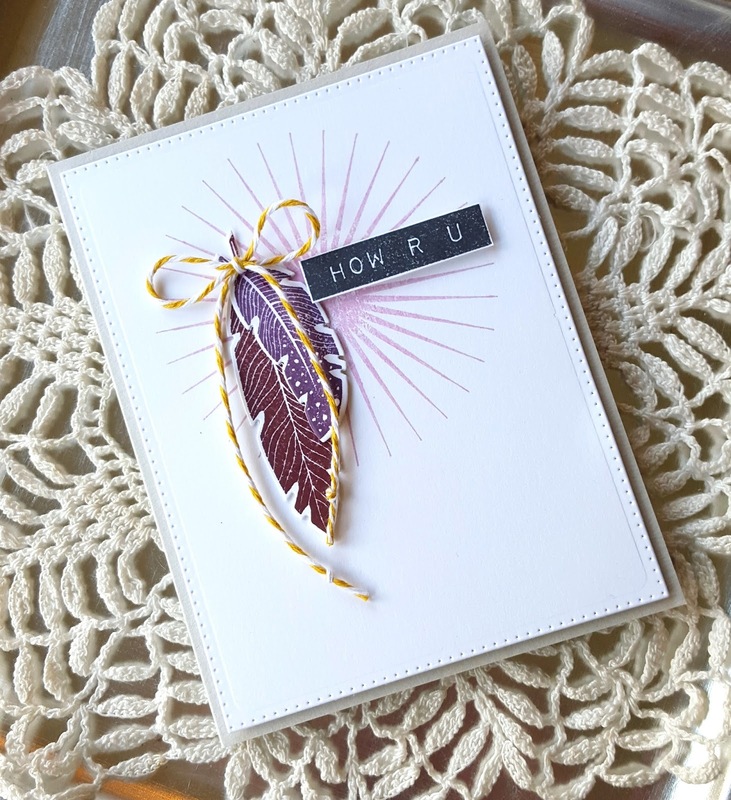 The next option... cut a feather an pop it on the card, but I didn't want that either. What to do... what to do?? Then it hit me... use the die to create a stamp. 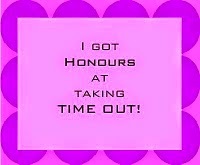 So that's what I did. I die cut the feather from some thick fun foam, inked it up with dark blue ink, spritzed the "stamp" and water color paper with water and stamped my feather! Love how it turned out. Some splatters of orange water color paint finished off my panel. Once it was dry I die cut it using an Avery Elle die. 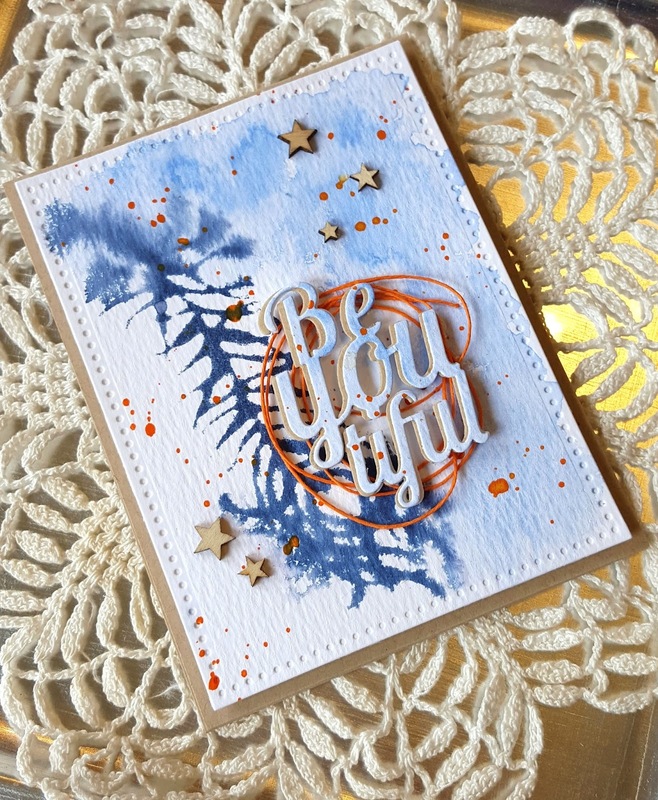 The Essentials by Ellen product I used is the Be-you-tiful die. I cut it from a panel I had water colored, but then ruined, and from kraft cardstock. The two where adhered with the kraft slightly off set. To bring in more orange I added a nest of orange hemp twine and adhered the die cut sentiment on top. Mounted the panel on a kraft card base and then added a few wooden stars. I also going to enter this into the current Simon Says Stamp Monday challenge: stamps and dies. I put a bit of a twist on the idea by using my die to cut a stamp so hopefully that counts. Hey friends!! Well... my kiddos finally go back to school on the 9th of September. We have all enjoyed the extended summer, but I'm ready for them to be back in the classroom. 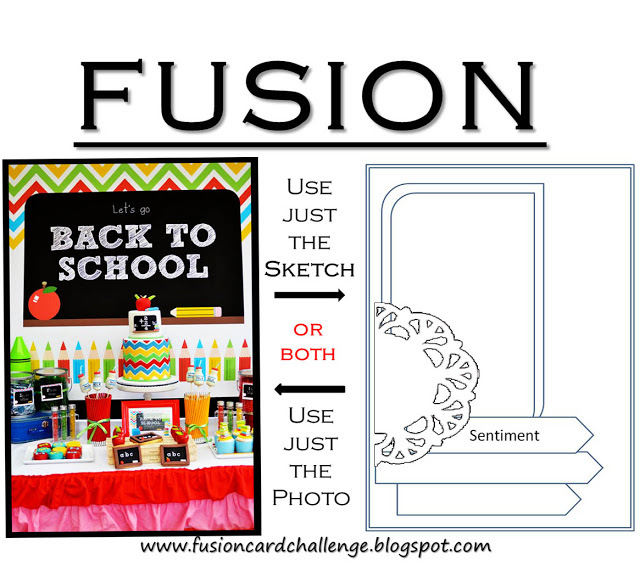 And with that in mind I have a card to share that I made for the current Fusion challenge: back to school. I used both the inspiration photo and the sketch for my card. 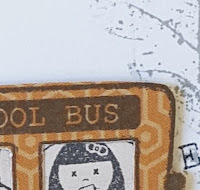 The stamps I used are the newly released Precious Remembrance Shop set School Days (I just love that fun little bus!!) 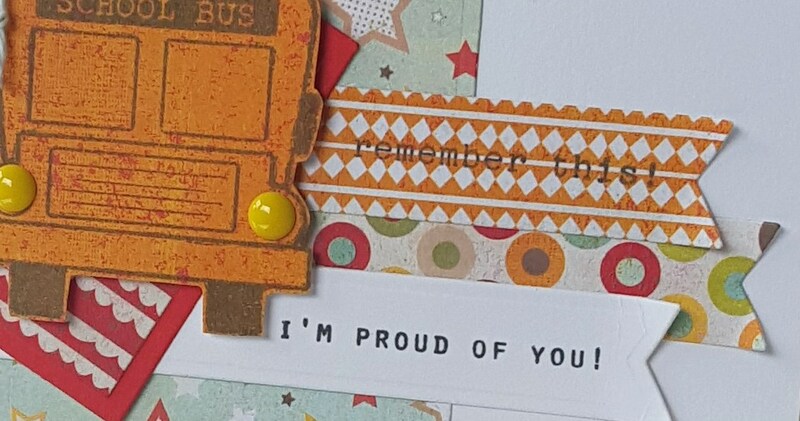 and a sentiment from the Precious Remembrance Shop set This Moment. In keeping with the bright colors in the inspiration photo I used some fun, somewhat bright patterned papers from the BasicGrey 6x6 pad Shine On. 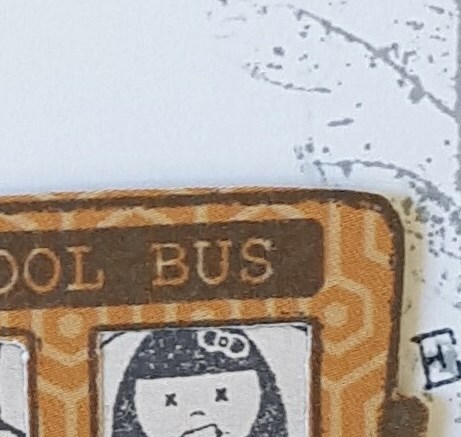 The bus was stamped on the orange paper and trimmed out. For the circular element I decided to go more angular and used a square instead. I die cut the squares using Spellbinders plain square dies. The banners were die cut using a MFT fishtail flag stax die. Initially I had all three cut from patterned paper, but the bottom sentiment was nearly invisible so I switched it out to white cardstock. I now see after taking the photo that the top sentiment is a bit hard to read, as well. So... I have included a close up photo so you can see both sentiments clearly. Some yellow enamel dots were added to the bus headlights for a fun look. And for a finishing touch I added some baker's twine in a light green. 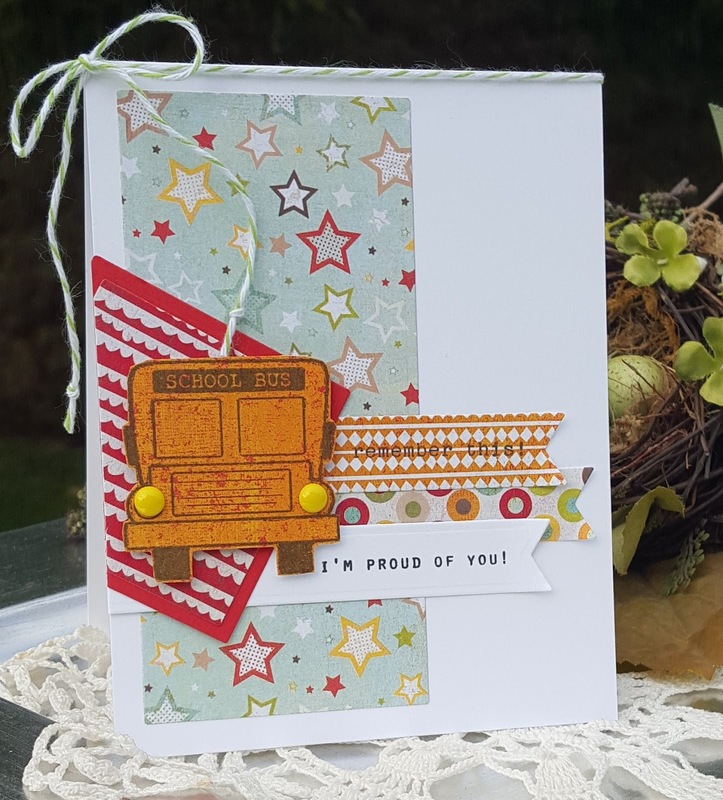 Adding this to the current Dies R Us challenge: Back to School. Hey friends!! Well, the weekend has arrived! Have a card I made for a few challenges: CASology - write, Color Throwdown and Freshly Made Sketches. When I saw the CASology challenge this week I just had to use the newly released Precious Remembrance Shop set, School Days for my card. You will be seeing a few more cards from me using that fun new set so stay tuned!! The layout for this week's FMS was absolutely perfect for a school themed card, too!! I pulled a couple of papers from the My Mind's Eye Kate & Co 6x6 pad that matched well to the Color Thowdown colors. 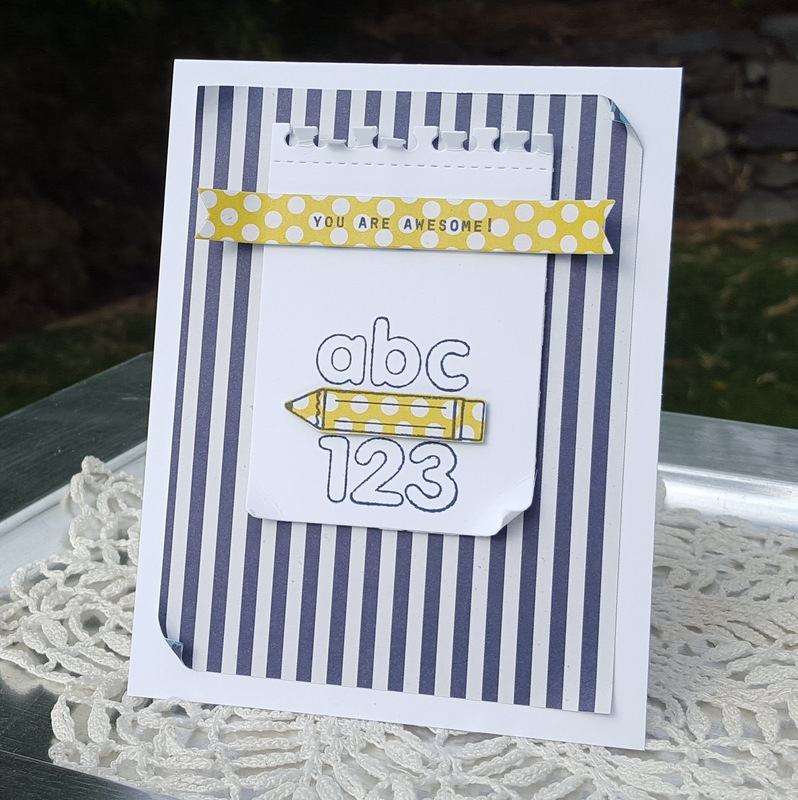 I stamped the abc/123 image on the yellow polka dot paper and then trimmed out the pencil. A notebook page was die cut with the PTI notebook page die, stamped with the same image using dark blue ink and then I adhered the paper pieced pencil. A banner was die cut from the same polka dot paper, stamped with the sentiment in dark blue ink and adhered to the notebook page. The blue striped paper was adhered to the card front and then the notebook page. I curled back the corners of the notebook page and the striped paper to give it that "dog-eared" look. Hey friends!! Popping in with a card that I made for several challenges: Sweet Sunday Sketch, ColourQ and Word Art Wednesday. When I saw the Sweet Sunday Sketch for this week I immediately knew I wanted to use the Reverse Confetti set "God is Good". 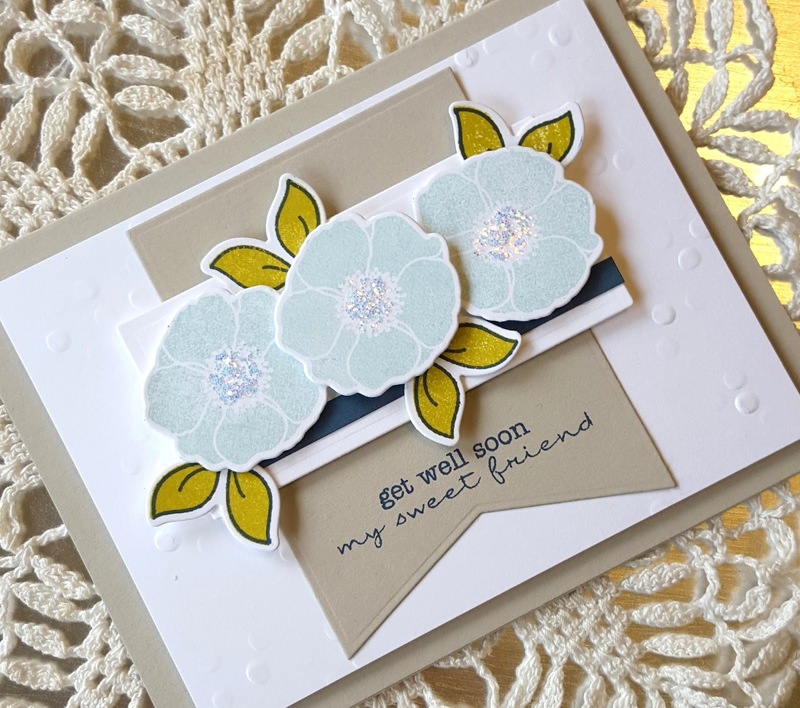 I teamed it up with another Reverse Confetti set, Petals 'n Posies to create my card. 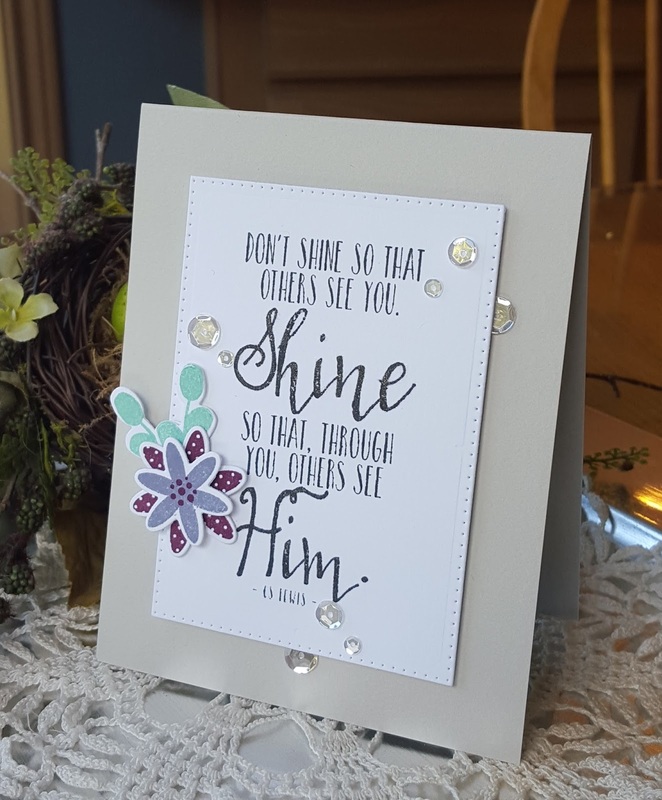 I die cut my panel using the Polka Dot Backdrop die set from A Jillian Vance Design and stamped it with the largest sentiment in the set. The flowers and leaves were die cut and then stamped using Stampin Up! Pool Party, Wisteria Wonder and Rich Razzleberry. I cut leave leaf image in half and then arranged the pieces on my panel, adhered them in place and then added the flowers. 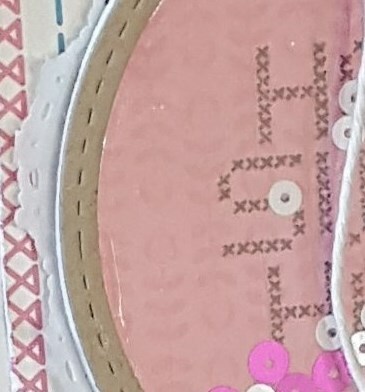 Clear Wink of Stella was added to the "shine" and "Him", but you can't really see it. Some clear Pretty Pink Posh sequins finished things off. I also have a post up on the Precious Remembrance Shop blog and here is a little peek of that project.